This book is the third entry in the new WONDER COMICS imprint as headed by Brian Michael Bendis. I personally don't think he has as much say in the titles that he isn't writing, purely based on the voice that Mark Russell has and how much of it was present in this issue. I like Russell quite a bit so I was looking forward to this. I don't think Stephen Byrne was a great fit for this book, though. This book needed a looser style, something much more energetic and vibrant than what Byrne delivers here. I'm also not particularly a fan of Byrne's style. I've read quite a bit of his stuff, and he was a semi-regular artist on GREEN ARROW, and I've never connected to his work. His characters and colouring come across as flat and not too inventive, nor are they interesting to look at. Sometimes his faces don't match what his characters are saying, such as a line said by Wonder Woman that doesn't at all match the dialogue that she said. Overall his stuff is very inconsistent and I hate to say that a better artist should have been chosen for this title, especially considering this might be many people's first exposure to Mark Russell. Russell does some interesting things with the script and the dialogue. I consider Russell to be a satirist and this is at the heart of anything he does, from THE LONGER RANGER to SNAGGLEPUSS. 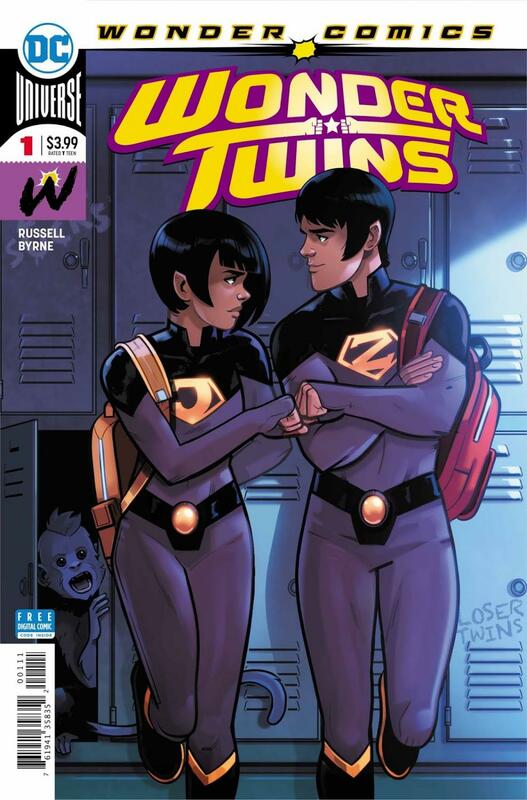 This issue is inherently funny and he frames the arrival of the Wonder Twins as a typical high school drama where the main characters are more concerned with their image and reputation than anything else. The twins are Zan and Jayna, and this issue focused more on Zan than his sister, but I'm sure the series will explore her over the course of this miniseries. Given that this is his first foray into the wider DC Universe, there are some strange choices he makes that I didn't agree with. The positive of focusing on the more humorous side of any universe is to contrast between the focused characters and the wider world. It's more funny that way; if everyone's funny and charming than nobody is. Sure, the tone of the book has to be accounted for, but contrast is key. That being said, when Superman refers to taking down Mxyzptlk by making him recite his name backwards as only possible in a German fairy tale, then that's something I take issue with. Not because I'm such a Superman fan that I need him to remain consistent in every iteration possible, but because he's faced Mxyzptlk before and he knows the rules as they relate to the imp. That reference felt like an unnecessary jab, or worse, Russell unable to discern where he should inject comedy or a funny line. Yes, I realise I'm telling Mark Russell how to write a funny book. I just feel like everyone, be it the most celebrated writer to the relative newcomer, has a chance to learn and grow from whatever kind of mistake they make. I'm fairly invested in this story. High school was an embarrassing experience for a lot of us but there were some good times to be had, and at this point in the story we're at the mindlessly embarrassing phase of high school where you're given that dreaded nickname. Obviously I find this story relatable, and that's prime material when writing a story in the DCU where things tend to feel a tad unrealistic. I want to see the relationship between Zan and Jayna develop because I feel like the relationship they have in this issue seems to serve the jokes and the plot rather than character development, in that the questions they ask each other lead to general jokes as delivered by Russell, or some kind of imaginary scenario that one of them foolishly believes in.